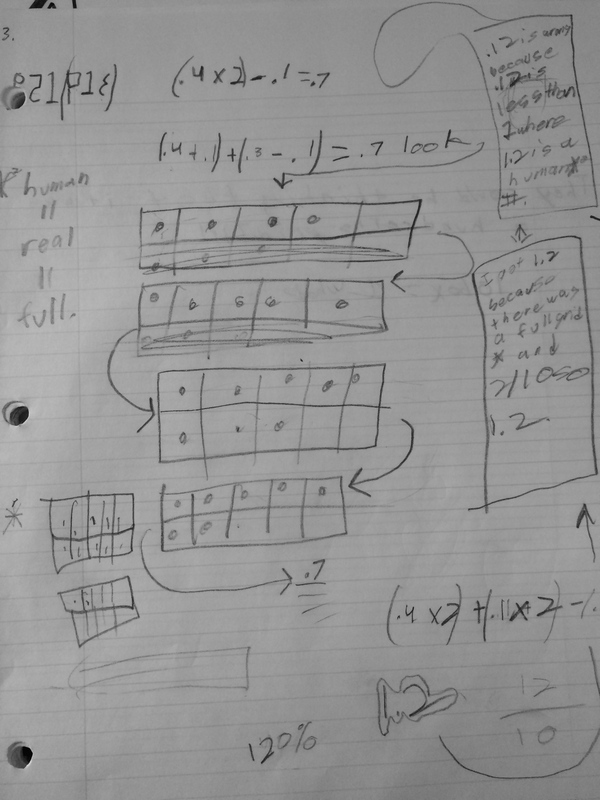 I love this introduction of decimal addition so much from last year, that I had to relive it again: https://mathmindsblog.wordpress.com/2014/02/19/decimals-in-a-one-frame/ It was just as amazing this time! 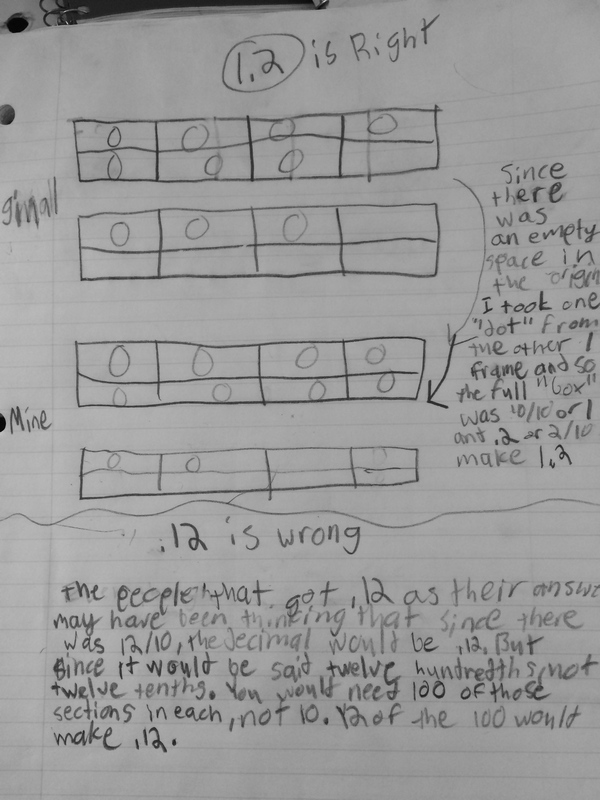 I opened with the same discussion about the ten frame, why we call it a ten frame, and then changed it to a one frame. We discussed the value of each box and were on our way. This year, I really pushed the students more into the equations that matched the frame on the board. 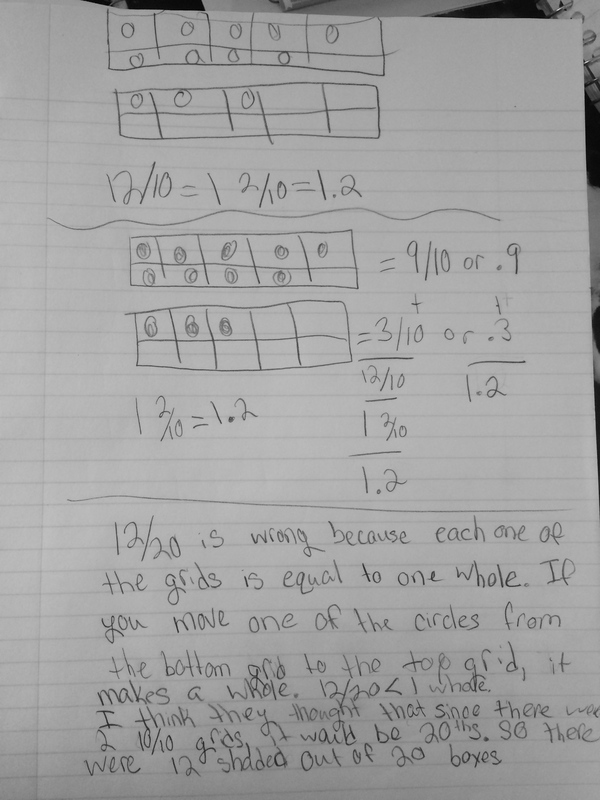 We did .9 as a group in a number talk setting with a lot of revoicing and restating to be sure the students could explain how their equations matched the one frame image. 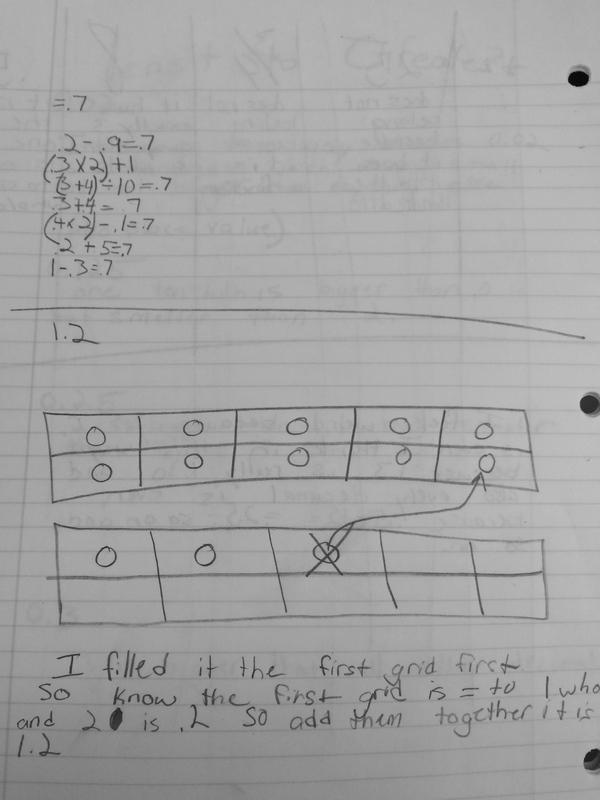 I then put up a frame showing 0.7 ( four tenths on the top row and 3 tenths on the bottom row) and sent them to their journals to write some equations by themselves before sharing out. 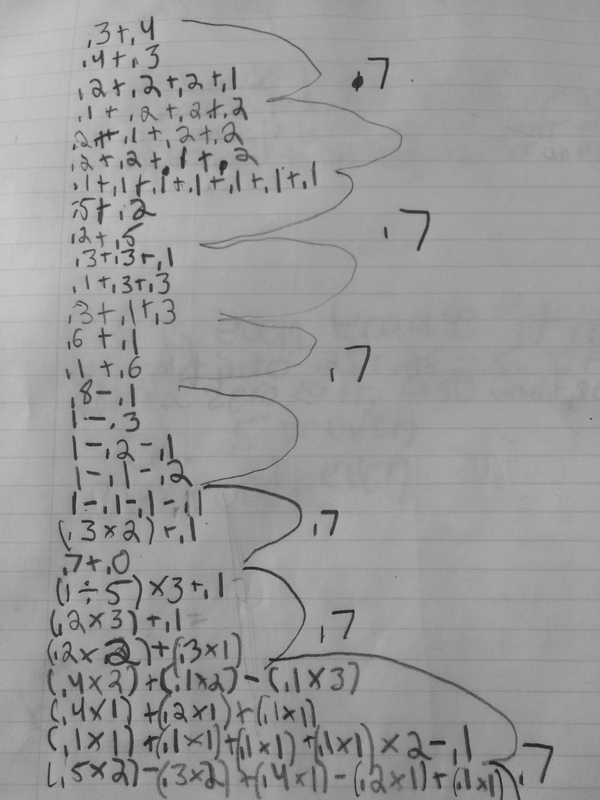 Here are some examples… (Some went crazy:) I think it is so interesting that without any formal work with decimal multiplication, students intuitively can see that any number of groups of some tenths can be written as multiplication. 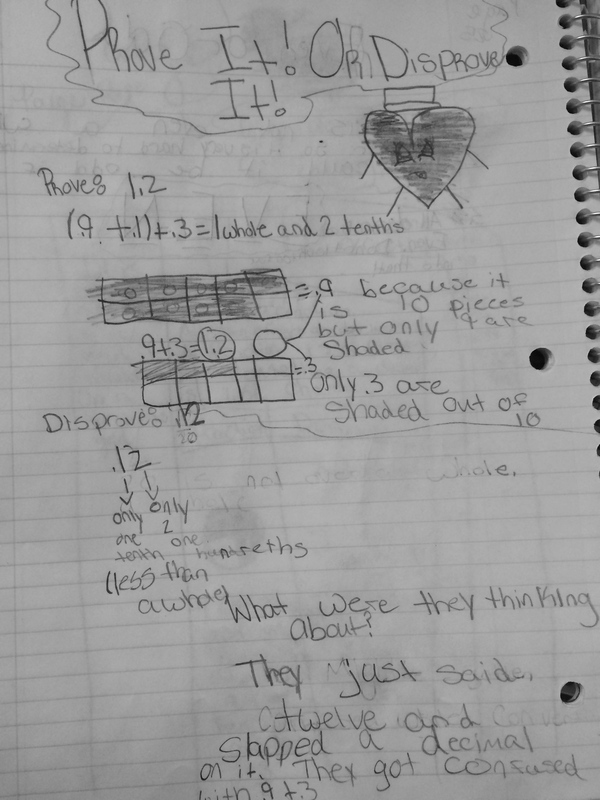 The one below was so interesting when he said, “.35 x 2” I asked him how that matched the picture and he said, “..since I like symmetry, I took the fourth dot on the top row, split it in half, and put the other half on the bottom row.” I asked the class how that gave him .35 and another student explained that because half of a tenth was 5 hundredth, it became .35 on each row. YES! 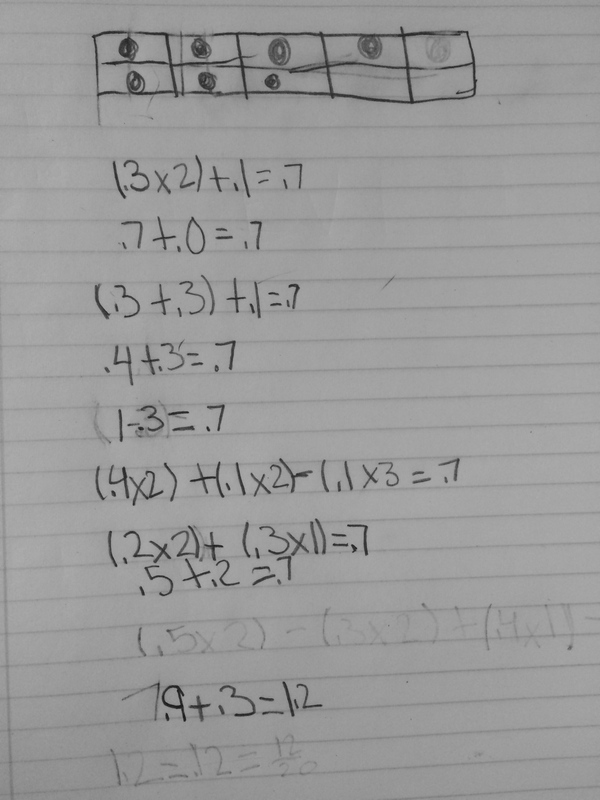 I think put up two frames, one with .9 and the second with .3 and asked students to write down how much was represented in the picture. Like last year, it was a mix of 1.2, 12/20 and .12. 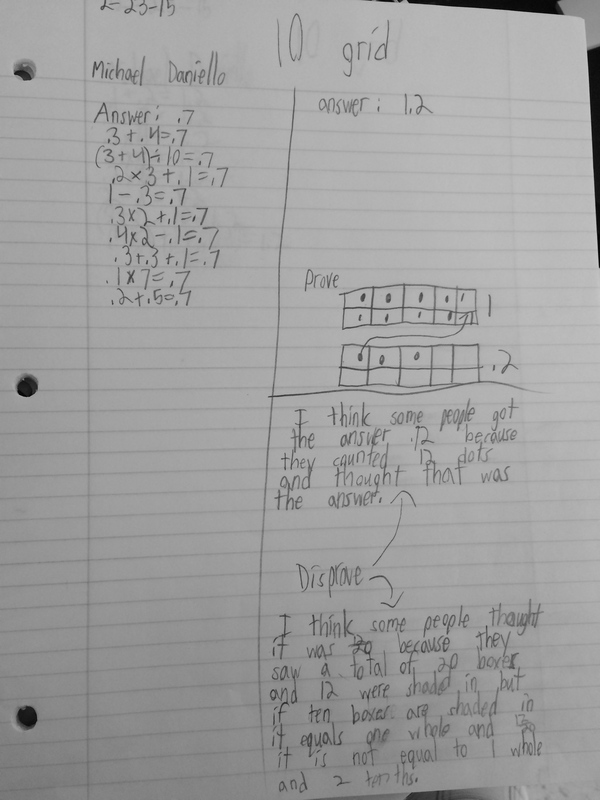 I asked students to prove the one they got as their answer and then explain where they think someone got confused with one of the answers they do not agree with. They did a beautiful job with this. 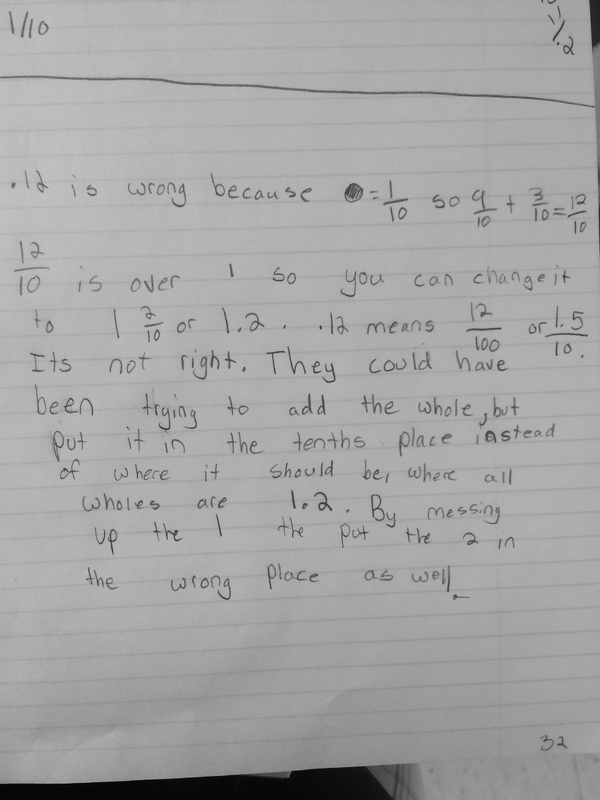 It was so nice to kick off our adding decimals with students identifying what the whole it, looking at decomposing numbers, being aware of place value and reasoning about what makes sense. I am SO looking forward to the rest of this work! 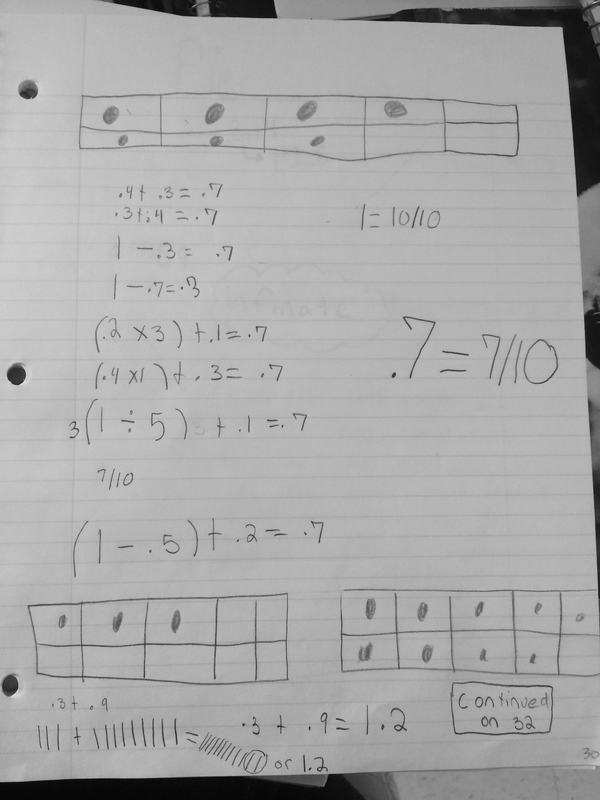 This entry was posted in 4th Grade, 5th Grade, Decimals, Uncategorized on February 24, 2015 by mathmindsblog. I got a similar reaction when I used base ten blocks and mat to investigate decimal place value last year! I think since my students are too often pandered to they were not able to look past their bad experiences to truly see the value in the manipulative. I am undeterred though! Thanks for this post Kristin! I’ll definitely be using this fantastic graphic organizer/visual model in my next decimal computation unit! I love how polite your kiddos are when they prove their peers wrong! All that hedging language! I know, aren’t they are so sweet? :) I did frame the question as, “What could that person have been thinking when they put that answer?” So that may have led to some of that.